— which, as you can see here, is the model I use. 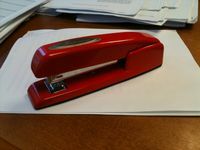 For shooting staples across the room, the Swingline really has limited utility and pales in comparison to more powerful staplers . . . . To test the Swingline, [two colleagues] ran across the room quickly while I tried to hit them with staples . . . . I managed to hit them only 30 percent of the time, far less than the 78 percent accuracy rate we registered with the Stanley staple gun we tested last winter. But if your practice does not involve shooting staples at your colleagues or support staff, the Swingline should work just fine. You have correctly selected the Swingline 747 as a "favorite" but do not adequately explain why you failed to give it the full 5 stars (assuming you apply a 5-star scale). That very model sits upon my desk even now and is without question the finest stapler ever designed for personal use. Your criticisms of it appear to reflect either simple user error or attempted uses of the 747 in ways for which it was not designed. If they don't retract their comments, we may end up resolving our differences with staple guns at dawn.